...yeah... I shot the group on a shoe box. Range was snowed under and I had to improvise. Both of these are superbly accurate handguns. Last edited by SecondHandSmoke; 02-04-2019 at 10:25 PM. Some Glock stuff. Man, I swear like the 7th shot in the string just as I was pressing the trigger my arms were like, "hey, let's suddenly just lift up a bit." Bastards. The Agent front was looking a bit fat today so I decided to try the TCAP/Defoor combo again (had them in my bag). Mad vertical stringing occurred. It would take a couple sessions for my brain to reset back to that big yellow square front. Not sure if I'll go back to Agents on this gun or something else entirely. Got that rear sight zeroed up. New Personal Best! Not my best score, but possibly my best group ever. 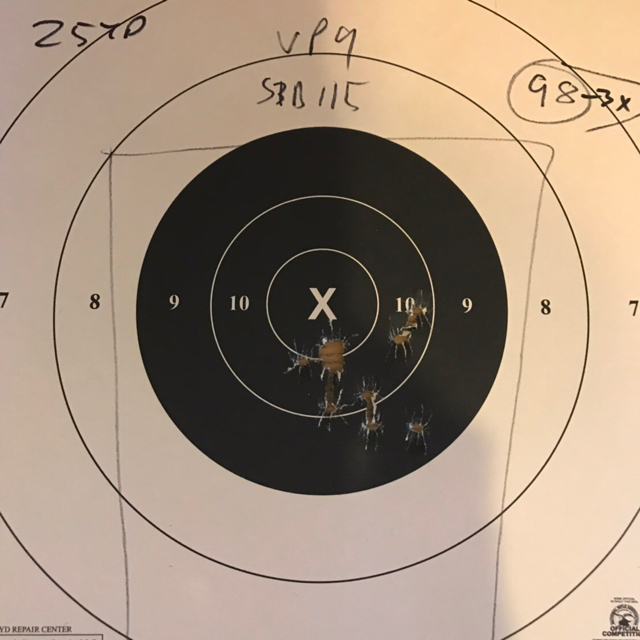 New to me VP9, second ten shots. S&B 115 grain FMJ. 25 yards. Glock 43 with Victory First barrel. Goal is to do this in under 20 seconds as Defoor does. I am over 20. 22-25. I’m seeing how accurate it is. First pic only has 9 holes, I thought I shot 10. So it is a 83/90. Last edited by Eric_L; 02-08-2019 at 08:29 PM. Last edited by ASH556; 02-12-2019 at 01:10 PM. Decided to practice in full duty gear. Went straight from work. Strong hand only I’m seeing significant improvements. Couldn’t get to my 50 yard range but needed some B8 25 yard love. Some of youse guys, I swear it's downright discouraging.